rotting meat of the desert, because it is the object of their search. They thrive on that diet. 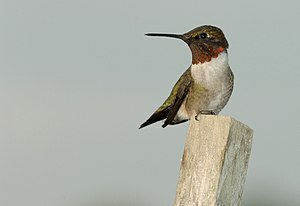 But hummingbirds ignore the smelly flesh of dead animals, and they look for the colorful blossoms of desert plants. The vultures live on what was. They live on the past. They fill themselves with what is dead and gone. But hummingbirds live on what is in bloom, because they seek new life. They fill themselves with freshness and life. Each bird finds what it is looking for. We all do. In life, there are two birds. The one bird looks for foolishness and stupidity, the other looks for wisdom. The vultures seek to fill themselves with the rotting flesh of drunkenness and debauchery, the hummingbird sobriety, freshness, and the Spirit. In the desert of this world you have your scavengers who are angry and ungrateful, but you also have those who hum a grateful hymn of thanksgiving. The irony is that you find what you are looking for. I’m sure that all of us want to find what is wonderful and fresh. We want to be in the company of people and things that add value to our lives. Unfortunately, we sometimes seek out the wrong things, and find ourselves drawn to things and people that diminish us rather than build us. Remember, it is all there for us to find.